Much of the country has spent the past week in a serious deep freeze. Some people have even referred to it as "Snowmageddon." 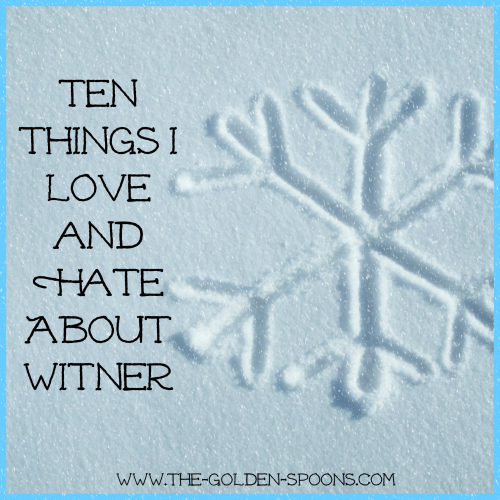 It seems appropriate that this week's Tuesday Ten topic is "Things I Love and Hate About Winter." A lot of people will probably find this odd, but winter is actually one of my favorite seasons - second only to fall. Why you ask?? Well, let me explain! 1) Snow and snow days - I live in central North Carolina we don't get much snow. We are "lucky" if we get one or two good ones each winter - and by "good ones" I mean anything more than an inch. As soon as the weather man hints at the possibly of snow in the forecast, the buzz begins. People talk about it everywhere you go and, as the chances increase, so does the anticipation. 2) The cold - After 15 years of marriage to a hot-natured guy (plus dating before that) and two summer pregnancies, I am convinced that my internal body temperature has shifted. I HATE to be hot. I would much rather be cold because you can always add layers, throw on a blanket, and curl up in front of the fire. 3) Winter wardrobe - I am much happier in jeans and sweaters than I am in tank tops and bathing suits. 4) Comfort food - Nobody wants to eat Chicken and Dumplings, Chicken Pot Pie, or Chili in the heat of summer. But, they are soooooo good on a cold, winter day! 5) Holidays - Winter encompasses Thanksgiving and Christmas and I love those two holidays. The gratitude, the gifts, the Christmas tree, the time with family - wonderful! However, as with most things, you have to take the good along with the bad and there are a few things I dislike about winter. 6) Sickness - Germs are at their peak in winter and, after three of us having the flu just before Christmas, I can definitely say that is one thing that I can do without! 7) Dry Skin - I have always had dry skin and my middle daughter does, too. It, of course, is worse in the winter. 8) Bundling up my kids - While I don't mind adding an extra layer or two myself, my kids hate it. I swear to you that, every day from the beginning of October until Christmas, they asked, "Can we wear short sleeves today?" Even though our temperatures were in the single digits last week, they still moaned and rolled their eyes when I pulled out their heavy coats. 9) The limitations of the weather - As I said, I am in North Carolina where we have beautiful beaches AND beautiful mountains, but neither is much fun to visit in the winter (unless you are going skiing.) The cold weather and snow (if there is any) keep us "trapped" inside. 10) Ice - I mentioned that I like snow but we are often in the "in-between" that gets ice. Ice is awful. You cannot play in it like snow. It is a threat to power and, therefore, heat. I'll take snow any day, but ice is no fun. Just for fun, I put this out on my blog Facebook page last week and got lots of responses. Sarah from Left Brain Buddha said "I'm a homebody, so I love the excuse to stay inside. And as a teacher, I love snow days!" Julie from Perspective on Parenting said "Best about winter, especially below freezing temps is: frozen dog poop, not having sweaty kids and soup can count as a meal; least favorites are: kids inside too much, and an unending pile of jackets and wet shoes in our mud room." Our Magical Chaos said "I love winter until after New Year's and then I'm ready for Spring! lol. I can handle cold temps as long as it's above freezing. Snow is pretty while it's falling but not on the ground. Yes, I'm picky." Mom's New Stage said "I hate how long it takes kids to get outside with all the bundling up!" Teresa of Crafty Wife said "I love the cold and being able to turn on the fireplace. There is something very cozy and appealing about curling up next to the fire with a good book. But...I hate when pipes freeze. It is a yearly occurrence in our apartment complex and it's such a pain whenever we have to deal with it." Brandy of The Mom Blogger said "My thing I love most about Winter is getting to pile on the covers and snuggling with my family. The thing I hate most about the winter is having everything I touch zap me atleast 10 times a day, lol." Tarana of Sand In My Toes said "Winter s the only time I can truly explore the outdoors I love so much. Why? Because I live in a desert!" Angela from WriterMom's Blog said "Hate--winter dry skin and the sickness that ends up trapped inside with us!" Comfytown Chronicles said " I love making soups and hearty "comfort" food, of course I had to use that word, but I mean foods like homemade pot pie, which ALL of my children will eat, and are easy to sneak vegetables into!" Thea of The Lint Trap said "As a parent I hate when they close school!!!" April of Pixie Dust Savings said "I hate that Florida doesn't get much a of a winter, though today it is a little chilly!" Amanda at Lady and the Trash said "The best part of winter is going back inside!" So, how about you?? Do you like winter? What are some of the things you love and hate about it?? Link up a post or leave a comment! Come link up again next Tuesday, January 21 which is National Squirrel Day (no kidding!) 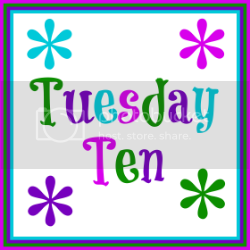 and the topic will be Ten Things That Distract Me. I think it's funny that some of my "hates" are things you love! Winter is my least favorite season. I am a total summer girl!! I also am not a huge winter fan, but will totally deal with it for Christmas and New Year's but then after that I am so done and ready for spring here! My favorite season is summer, so definitely not my time of the year. I have been making a lot of soups lately! Comfort food is definitely better in the winter, when it's not hot outside. Ha! It is funny, huh? I much prefer winter to the heat of summer! I like the more relaxed pace of summer, but I can't stand the heat! Sounds like we have a lot in common! I hope we get at least one good snow this year. If not, I'm not sure who will be more disappointed - me or my kids! Definitely has its advantages and comfort food is one of them! I wish I liked winter more. I have pretty bad cold intolerance and summer is the only time I stop wearing thermal pants and shirts and extra layers of jackets. I get your reasoning about "adding layers" I used to say the same thing, but since I'm only "not cold" on days of 80+ degrees, I feel as though it's lame for me lol I can only add so many layers before I can no longer function as a human being lol And honestly, having to always wear long sleeves, pants and fully-covered shoes all year long really limits my wardrobe choices! I'm a summer lover all the way - in the winter I feel like I'm always cold which I hate but I don't mind being hot!! I have never liked winter and I bet I never will. My mom was visiting this weekend and I came down with the crud and I was complaining and she said, "You said the same thing when you were five. Never changed." Nope. And yet. I live in New England. I guess the other three seasons really give us their A-game. I love boots. And really great snow. I can't stand the icy slush that we most often get here in Northern VA, or the fact that school is cancelled just because it's cold outside (wimps!!!). I like fires and comfort foods (but now you made me crave a chicken pot pie, dangit!) but not the salt and driving with muck all around. I don't really mind winter though. I love hibernating in the winter, but I get antsy pretty quickly. I prefer winter clothes, I love boots, and I can blow my hair out without the humidity curling it back up. I hate how dirty my black car gets, the chapped lips, and the bare trees. I could have written this post in a "my sentiments exactly" kind of way. We are coastal NC, so even less of chance of snow than you. Many times that you see the pink on the satellite image, the pinch that in the green is where we are. Except for warm weather activities like going to the beach that I really don't do above 90 degrees anyway - I hate HOT too. I am the hot natured one hear. My husband hates the cold. He opted to go on a deployment (before me) instead of doing cold weather training here in the states. Oh dear, I love your list and have grown to love the traditions that come with winter, but omg the cold, I hate! Agree to disagree? Totally the opposite here! I hate being hot! The crud is definitely one thing I could do without in the winter. Hope you are feeling better now! Right?! I think about three snowflakes fell here last night and they put school on a two hour delay! It is a little ridiculous - but sleeping in was nice! I definitely prefer winter clothes, unlike my kids who would prefer to wear shorts and tank tops year round! One of my best friends lives in Columbia! :-) I guess our winters aren't that bad - if we lived up north we might no like them so much! We got delayed here in NC too due to "cold" not even snow. It got below 20 degrees and they delayed our entire school system because we aren't prepared for cold temperatures...the day after I watched all the Green Bay Packers fans stand outside in the most frigid game in recent history...love NC. Haha -great list and I can relate! I love snow days when the kids get to stay home and we all drink hot chocolate! Yep! We are close by in NC too and we were on a delay for two days. We were actually delayed again today because there were a few snowflakes last night. I'm sure the people from up north laugh hysterically about how we freak out in wintery weather! Snow and hot chocolate - Yay! !